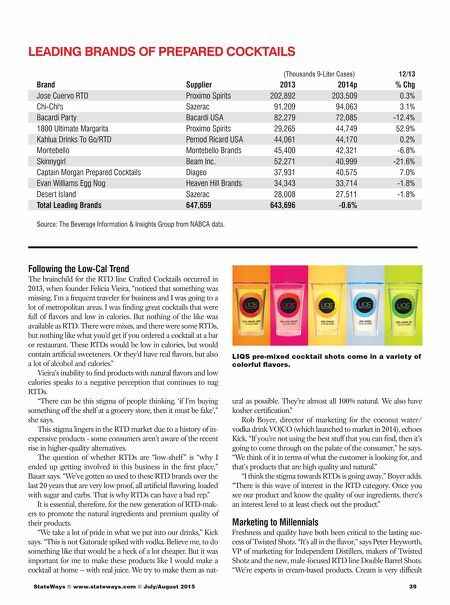 39 StateWays ■ www.stateways.com ■ July/August 2015 Following the Low-Cal Trend The brainchild for the RTD line Crafted Cocktails occurred in 2013, when founder Felicia Vieira, "noticed that something was missing. I'm a frequent traveler for business and I was going to a lot of metropolitan areas. I was fi nding great cocktails that were full of fl avors and low in calories. But nothing of the like was available as RTD. There were mixes, and there were some RTDs, but nothing like what you'd get if you ordered a cocktail at a bar or restaurant. These RTDs would be low in calories, but would contain artifi cial sweeteners. Or they'd have real fl avors, but also a lot of alcohol and calories." Vieira's inability to fi nd products with natural fl avors and low calories speaks to a negative perception that continues to nag RTDs. "There can be this stigma of people thinking, 'if I'm buying something off the shelf at a grocery store, then it must be fake'," she says. This stigma lingers in the RTD market due to a history of in- expensive products - some consumers aren't aware of the recent rise in higher-quality alternatives. The question of whether RTDs are "low-shelf " is "why I ended up getting involved in this business in the fi rst place," Bauer says. "We've gotten so used to these RTD brands over the last 20 years that are very low proof, all artifi cial fl avoring, loaded with sugar and carbs. That is why RTDs can have a bad rep." It is essential, therefore, for the new generation of RTD-mak- ers to promote the natural ingredients and premium quality of their products. "We take a lot of pride in what we put into our drinks," Kick says. "This is not Gatorade spiked with vodka. Believe me, to do something like that would be a heck of a lot cheaper. 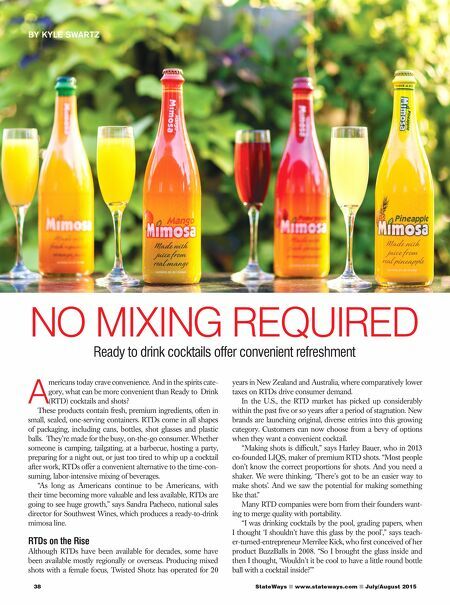 But it was important for me to make these products like I would make a cocktail at home — with real juice. We try to make them as nat- ural as possible. They're almost all 100% natural. We also have kosher certifi cation." Rob Boyer, director of marketing for the coconut water/ vodka drink VO|CO (which launched to market in 2014), echoes Kick. "If you're not using the best stuff that you can fi nd, then it's going to come through on the palate of the consumer," he says. "We think of it in terms of what the customer is looking for, and that's products that are high quality and natural." "I think the stigma towards RTDs is going away," Boyer adds. "There is this wave of interest in the RTD category. Once you see our product and know the quality of our ingredients, there's an interest level to at least check out the product." Marketing to Millennials Freshness and quality have both been critical to the lasting suc- cess of Twisted Shotz. "It's all in the fl avor," says Peter Heyworth, VP of marketing for Independent Distillers, makers of Twisted Shotz and the new, male-focused RTD line Double Barrel Shots. "We're experts in cream-based products. Cream is very diffi cult LEADING BRANDS OF PREPARED COCKTAILS (Thousands 9-Liter Cases) 12/13 Brand Supplier 2013 2014p % Chg Jose Cuervo RTD Proximo Spirits 202,892 203,509 0.3% Chi-Chi's Sazerac 91,209 94,063 3.1% Bacardi Party Bacardi USA 82,279 72,085 -12.4% 1800 Ultimate Margarita Proximo Spirits 29,265 44,749 52.9% Kahlua Drinks To Go/RTD Pernod Ricard USA 44,061 44,170 0.2% Montebello Montebello Brands 45,400 42,321 -6.8% Skinnygirl Beam Inc. 52,271 40,999 -21.6% Captain Morgan Prepared Cocktails Diageo 37,931 40,575 7.0% Evan Williams Egg Nog Heaven Hill Brands 34,343 33,714 -1.8% Desert Island Sazerac 28,008 27,511 -1.8% Total Leading Brands 647,659 643,696 -0.6% Source: The Beverage Information & Insights Group from NABCA data. LIQS pre-mixed cocktail shots come in a variety of colorful fl avors.